Lawmakers in Texas passed a law that supports patients in making informed decisions about choosing new and innovative healthcare treatment options for chronic conditions. Government officials in Texas have passed a bill that supports stem cell treatments, placing Texas at the forefront as the first state to explicitly provide legal validation to stem cell treatments for terminal illnesses. This new law falls under the category of the “Right to Try” initiative. 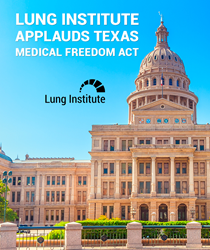 The Lung Institute, the largest stem cell treatment center in the U.S. for chronic lung diseases, applauds this legislation, particularly in light of the great success they’ve already seen at their Dallas clinic, which opened in April of 2016. The law not only provides patients and their primary care doctors with support in making informed decisions about treatment options for chronic debilitating conditions, but also lays the groundwork for regulations that ensure patient safety and treatment efficacy. Lung Institute’s clinic has worked closely with an IRB since first opening, and collects all patient data and outcomes. With any new procedure, collecting outcomes is imperative in measuring treatment effectiveness, and Texas’ requirement for IRB oversight ensures that stem cell treatment centers provide data and have patients’ best interests in mind. One Lung Institute patient from Texas, Herbert K., decided to visit the Lung Institute for treatment when his lung capacity was as low as 15 percent due to COPD. Within two months of treatment, a pulmonary function test revealed his lung capacity had improved to 31 percent. COPD is a progressive disease, meaning it will only get worse with time, and there is currently no cure. COPD patients face limited options, and laws like the “Right to Try” act in Texas that show support for stem cell treatments provide hope for patients with terminal illnesses. Watch Herbert’s full testimonial video HERE. The Lung Institute is the leading medical provider of regenerative cellular therapy for lung diseases such as chronic obstructive pulmonary disease (COPD), pulmonary fibrosis and interstitial lung disease in the United States. To date, the organization has treated more than 4,000 patients. The Lung Institute’s in-house outcomes summary shows that 84.5 percent of COPD patients studied saw an improvement in their quality of life. In 2013, the Lung Institute in Tampa, Fla. opened. Now, the Lung Institute operates clinics in Tampa, Fla.; Nashville, Tenn.; Scottsdale, Ariz.; Pittsburgh, Pa, and Dallas, Texas. For more information, please visit http://www.lunginstitute.com or call (800) 382-8095.